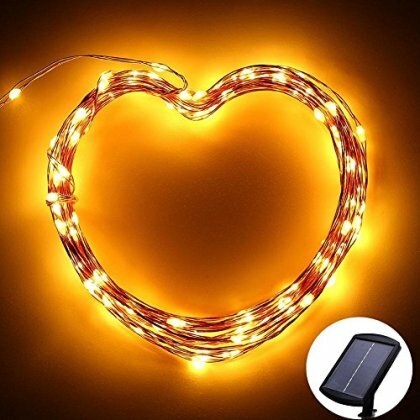 ★SUPER BRIGHT LIGHTING EFFECTS: Rather LARGER solar panel equipped with LITHIUM CELL (unlike others with ordinary Ni-MH Battery) can CONSTANTLY power up the super bright 120 individual LEDs lights, in Warm White sparkling on a 20 feet thin, flexible, and waterproof double-copper wire. It creates romantic fairy effect and feeling. ★Easy installation: Push the panel stick into the ground, or screw it into the wall by screws included in package, let the panel face sunlight. ★Solar powered, no electricity needed, energy saving. It will illuminate during the night without electricity. NOTE: The solar panel should be directly facing sunlight in order to be recharged.